(Specialized in Construction Mgt.) Unilag, was appointed as the General Manager, Lagos State, New Towns Development Authority (NTDA) on the 1st of June , 2016. Consequently, he becomes the Chief Accounting and Administrative Officer of the Authority. His responsibilities among others include the organization of the Authority, the supervision of all projects executed by the Authority and overseeing the day to day administration of the office, through the four main departments and Eight units highlighted as follows: Administrative Department , Town Planning Services Department, Engineering Services Department and Accounts Department among others. Public Affairs Unit, Audit Unit, Procurement Unit, Legal Unit , Planning, Research and Statistics Unit and Real-Estate Unit . Prior to his appointment as the General Manager, New Towns Development Authority, which is saddled primarily with the responsibility of carrying out among others; establishment of new schemes in the Five divisions of the state, site selections of Land on request by Government/Ministries/Departments and Private Agencies/Developers in suitable and strategic locations and the monitoring of developments within Government schemes to prevent illegal developments/shanties/sand mining. 1. St. Paul's (Anglican) School, Idioro-Alakara, Lagos (1968-1974). 2. Zumratul Islamiyyah Grammar School, Yaba/Igbogbo (1976-1981). 3. Federal School of Arts and Science, Victoria Island (1981-1982). 4. University of Ife (now Obafemi Awolowo University) (1982-1987) where he bagged B.Sc. (Hons.) Quantity Surveying in August 1987. 5. He later went to the University of Lagos between 1999 and 2000 for M.Sc. Building (specialized in Construction Management). 1. He had his full professional membership of the Nigerian Institute of Quantity Surveyors in 1991 after waiting for the mandatory 3 years post-graduateship qualification; he passed the professional examination in the year 1990. 2. He was then fully registered with the Quantity Surveyors Registration Board of Nigeria in 1991. 3. Full Member, Institute of Construction Industry Arbitration. 4. He was elected as a fellow of NIQS in November 2007. 1. Lagos State Development and Property Corporation, March 1991- October 2015 where he attained to the level of Management Staff as The Deputy General Manager (Projects), to oversee the Quantity Surveying Division. 2. He has the credit to himself as the first employee of LSDPC be IT compliance, having gone to train himself privately for this purpose. 3. 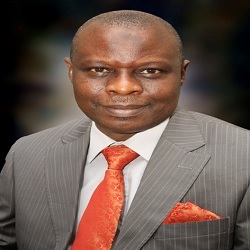 He transferred his service to the main stream of the Civil Service as a full Director and seconded back to Lagos State Development and Property Corporation in November 2015 as Acting Chief Executive Officer. Mr. Akewusola has International exposure in which he has travelled to all the continents in the world and also, he is a resource person for both the Nigerian Institute of Quantity Surveyors and the Construction Industry locally and internationally. He has embarked on many researches ranging from social Housing, Environmental Design & Management, Effective Project Planning and Control ,Risk Involved in Public - Private Partnership, Road Maintenance Culture, Effect of Economic Trade Cycles in final cost of construction and Solving housing problems in a developing economy. He likes Travelling, jogging, watching football and playing in-door games.